Latest Revision - October 16th, 2014 - See "Newest". It's like Jesus said of His disciples in [Luke 19:40], "I tell you that, if these should hold their peace, the stones would immediately cry out." Jesus was talking about his disciples ushering Him into Jerusalem for the 'day of His visitation'. And, Jerusalem didn't know that's what it was. They couldn't interpret the signs of the times. This website was created because its author feels like the stones are starting to cry out about Jesus' coming visitation. I feel that as of 2008 we are beginning to see the "beginning of sorrows" Jesus spoke about in [Mat. 24:8]. So, what does this have to do with Christians, right now? What is there on this website that should be of interest to the bulk of today's Christians? The answer is that this website is all about what is happening to Christians right now, and where it is all going. It is the 'where it is all going' part that originally motivated the setting up of this website. But, since January, 2009, the 'right now' part has suddenly become a focus. The website contains a number of downloadable PDF documents dealing from a Christian viewpoint with what is going on now and where it is headed, globally and in the United States. These documents will hopefully enable readers to interpret the signs of our times, happening in the churches, world, nation, government, economy, and finance. Up until January, 2009, the papers were strictly about the Church, which is Christianity in both individual and corporate forms. And, they were focused on what Jesus called " ... great tribulation" [Mat. 24:21]. But, a corner was turned in January, 2009. Now included are synopses of current books, both Christian and secular, that deal with what's going on, today. From these synopses, papers are being written that form an integrated picture of current events, from the Christian perspective. It seems reasonable that these illustrate the "beginning of sorrows", which occur in the period leading into The Great Tribulation. WHAT LED UP TO THIS. The original focus was on Church restoration, so that it can be prepared for the corporate level spiritual warfare that is even now necessary to cope with events leading into the full-blown Great Tribulation. Jesus said that such restoration would be necessary [Mt. 17:11]. This restoration is of the Prophetic, leading to the restoration of the Apostolic. Both have been formally missing from the corporate Church since about 250 A.D. Please understand that the original papers and book length manuscripts on the Restoration of the very end-times are based on hundreds of scriptures. The Restoration is in the Bible and always has been. But, many Christian churches do not teach it. Why not? It may well be because it has not been time, yet. There's a saying that we serve a 'just in time' God on a 'need to know' basis. He provides just in time and just what you need to know. God controls everything in His creation, including the timing of events. The fact that this scriptural story is just now surfacing probably means that Christianity is just about to need it. This story commenced in 1997, when two sets of underlying scriptures were cited by God to a prophetess in a home church. They were interpreted at the time by a Bible teacher ... me. Subsequently, I received some more scripture citations, directly. The scriptures led to the writing of two book-length manuscripts, which are freely downloadable from this website in PDF format. One other book-length document had previously been written, which turned out to also illuminate the later two. Other shorter documents expanded on some of the issues, and they are also included, here. IT'S ALL ABOUT 'THE DAY OF THE LORD'. All these documents show God's biblical plan to lead the Church through an end-times calamity that is to befall it. The word, 'calamity,' is used advisedly, because of how disastrous it is for the Church and ultimately for the world. It affects the Church first. It's a part of the whole fabric of the very end-times. And, it's not what you ordinarily hear in Sunday School. It was called The Day of the Lord in the Old-Testament and The Great Tribulation in the New-. It's Biblical, but you won't hear about it in your average Christian Church. And, that's part of the problem. In fact, that's part of why it's going to happen. Why this website was created is to offer to believers biblically-based reading materials that detail what is going to happen, what is happening now, ... and why, ... and how. Make no mistake, very hard times are coming, and Christians need to be prepared. Helping to prepare them is the motivation for this website. IS THIS JUST GLOOM AND DOOM? No, ... it's a 'heads up,' a call to duty for Christians of the very end-times. And, it is an aid to Christians for interpreting the signs of our present time. Both New Testament and Old Testament are very specific about what is going to happen to Church and world in the very end-times. And, the Church still has a role in those times. The writings on this website specify what that duty is. From this point, you might look at the Library INDEX, which is also in the left-hand navigation column on every page. It gives 11 pages of short descriptions of the numerous PDF documents. For those of you looking for a Christian perspective on what's going on in the U.S. right now, in terms of political and anti-Christian happenings, see the 39-page paper, entitled The Battle for America (2009 - Updated). To get a feeling for what this whole website is about, you might read the 21-page paper, entitled The Sixth Move - A Summary (2009). This paper gives a quick tour of all the topics covered on this website. It is typed on one portion of the Israelite walk from captivity to freedom in The Promised Land. This is a Bible-based Internet Teaching ministry, focusing very specifically on God's plan for Earthly Christianity in the time period from now until the events of [Rev. 8]. This ministry focuses on what needs to be taught in the churches and out, so that Christians may understand what is really going to happen, leading up to and during what is called The Great Tribulation. Christianity and the world are headed into a time of great physical judgment, right here on Earth. And, Jesus is in charge of it. And, it's in the Bible. But, most Christians are not aware of it. So, Alpha Aquila is providing Bible-based writings that disclose, define, and detail these coming events. The very latest writings include synopses of recent secular books, and papers based on them. These complement the biblical studies and provide a framework for interpreting our signs of the times. Things are going to get really bad. And, we see the lead-in events already happening. They are signs of the times, leading straight to the events of Chapter Eight of the Book of Revelation. When those events happen, people are going to be looking for Christians, to ask, "Why is your God letting this happen?" It will be the so-called 'Great Harvest' looking for evangelists, rather than the other way around. When The Great Tribulation hits, Christians need not be surprised that they haven't been raptured. There is no easy out for believers, just as there was none for Jesus. There is no Early Rapture, as the nineteenth century false teacher, John Nelson Darby, promised. Christians are here for most of the Great Tribulation, just as Jesus said. And, that is the Biblically documented will of God. The written materials of Alpha Aquila give the "What," "Why," and "How" of God's Great Tribulation. Not all of it, of course, because no Christian is given knowledge of all of it. But, enough to help others who have questions to which they need answers. Both Alpha and Aquila are New Testament words. Aquila was a Jewish tent-maker who had a church in his home, together with his wife, Priscilla. The meaning of his name is 'eagle.' Our present ministry also began with a church in the home of this writer and his wife. Altair is a navigational star, which this writer used often in his days as an Air Force Navigator. Altair is the primary, or 'alpha' star, in the constellation, Aquila. Therefore, for nostalgic reasons, Alpha Aquila Ministries was named after Altair. There is another reason. Because of the eagle's sharp vision, it has been viewed as symbolic of the biblical seer or prophet. 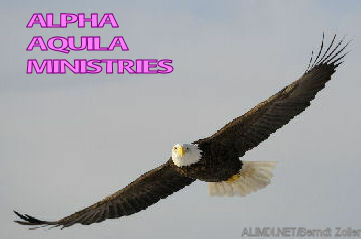 So, Alpha Aquila has taken the symbol of the eagle for this ministry. I view my personal ministry to be like that of Heman, who was a 'seer in the words of God' for King David [1 Chron. 25:5]. WHO IS THE PRINCIPAL OF ALPHA AQUILA? John H. Painter has labored as a Bible teacher in the Romans-12 teaching and prophetic gifts since 1983. In the world, he was a 25-year teacher of Electrical Engineering, now retired, a 1960s NASA 'Rocket Scientist', and a 1950s Air Force Navigator. A short resume΄ is in the last section of this website. This website has been up since the 25th of November, 2008, but not many people have found it. That is because the writer has been enjoined to not advertise or 'push' this website by any means. That way, it is the Lord Who is in charge of bringing visitors to the site. Visitors and megabytes downloaded monthly run around 108 and 9 MB of PDF files, respectively. Most of the visits are from the U.S., with numerous foreign countries also being seen. It seems clear that over the period of its existence, this website has been used by relatively few. However, those few are downloading and reading the documented materials. It will be interesting to see what comes of all this. For more details on what's available on Alpha Aquila, and why Christians might want to read it, hit "NEXT."